I would love to share my passion for music and learning with you and your child!! My first degree is a Bachelor of Commerce (Hons.) from Queen’s University, and prior to starting my family, I worked for several years in the software industry. I have completed my Elementary Piano Pedagogy with the Royal Conservatory of Music, and was the Gold Medal recipient for Saskatchewan in 2013 (awarded to the highest mark in the province!). To the right, I am with Dr. David Brubaker at the Gold Medal Ceremonies at the University of Regina. As my studies continue, I believe it is vital for teachers to always engage in professional development. Always ask your teacher what their qualifications are!! You want your child with someone who is fully engaged in the learning process! That is our business! I am the Royal Conservatory of Music Representative for the Swift Current area – if you have any questions about the exam process and its benefits, please ask! 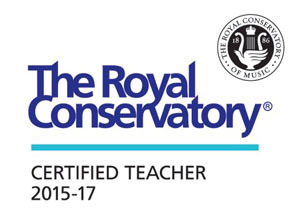 I am a member of Registered Music Teachers of Swift Current and Publicity Officer. As an RMT, I am able to provide my students with access to a wide variety of programs, competitions and scholarships. I am a member of the provincial board for the Saskatchewan Orchestral Association where I have met wonderful teachers and musicians across the province, and work to bring orchestral music to youth in the province. I am on the The Band Parents Auxiliary and previously spent many years on the Executive for Swift Current and District Music Festival. I feel it is important, as a music professional, to volunteer and contribute to the larger music community. This allows me to connect with other professionals in our community and to help guide our young musicians in whatever their musical path may be. In addition, I have taken post-secondary courses in Environmental Law, Child Psychology, and Japanese (I can ‘putter’ in French and Spanish as well).